Missing Squirtle or Onyx? Know where to go for Pokemon with our handy guide. With more than a hundred Pokéstops and at least seven gyms in the area, head Downtown with a fully charged phone (and an extra battery) for your dose of Pokémon. Klyde Warren Park: The park is already a great place to hang out on a weekday night thanks to the variety of activities available. Take a break from catching Pokémon to enjoy the children's park or splash around in the water fountains to cool off from the summer heat. Belo Garden: The Pokémon pros know this Downtown park comes alive with activity after dark and you definitely won't be alone. It's a popular spot for lures so there's plenty of opportunity to make a new friend! Reunion Tower GeO-Deck: Take your Pokémon game to new levels with a trip up to GeO-Deck. The observation deck offers 360-degree views of the city and it's a great place to plan out your Pokémon adventures. Pro tip: Reunion Tower GeO-Deck is part of Dallas CityPASS, a discount admission program that grants you access to 4 Dallas attractions with one purchase. Bishop Arts District: Thanks to the great accessibility to this district from Downtown on D-Link, visitors can get to Bishop Arts District quickly. Enjoy the quaint streets of the neighborhood, known for its unique lineup of restaurants and shops and artistic murals scattered throughout the area. A pie break is definitely in order so grab a seat outside Emporium Pies. Dallas Zoo: The zoo has put together a Pokemon guide for zoo visitors. The Dallas CityPASS gets you in the door at a discounted rate, so all your energy can go into exploring the more than 30 Pokestops on zoo grounds and three gyms while also checking out the Giants of the Savanna exhibit, a shared space for elephants, giraffes, zebras, lions and many more species. The exhibit is set up to mimic how these species would interact in the real world and you can even get up close and personal with a giraffe! The diversity of Pokémon available in the area is just as diverse as the neighborhoods. Go from the serene green spaces and outdoor adventures to vibrant shops, restaurants and bars for more of a city feel. 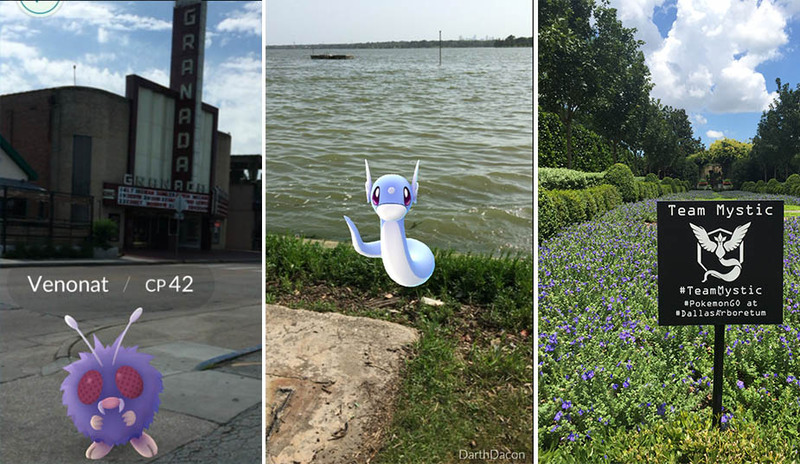 White Rock Lake: The lake is one of the most popular spots for Pokemon hunting in Dallas. Jump on the 9-mile loop to see different views of the lake (bike rentals are available nearby the lake too!). Thanks to the close proximity to the water, there's a great chance for a rare sighting of a Poliwag nearby. Lower Greenville: Enjoy dinner on the rooftop patio at HG Supply Co. before heading out to the streets below. The street is lined with unique shops and restaurants to explore while your phone recharges. Start at Truck Yard, a large outdoor patio with a country theme and daily food trucks to talk through your next round of Pokémon plans. Dallas Arboretum: The Dallas Arboretum, 66 acres of greenery and beautiful florals, has a special Pokémon players lounge (available through August) to recharge your phone (and your body, it's hot in Dallas!) Check out the flower gardens dedicated to each team (in the corresponding yellow, red and blue colors) before stopping by the Rory Meyer's Children's Adventure Garden for a kid-friendly children's experience. 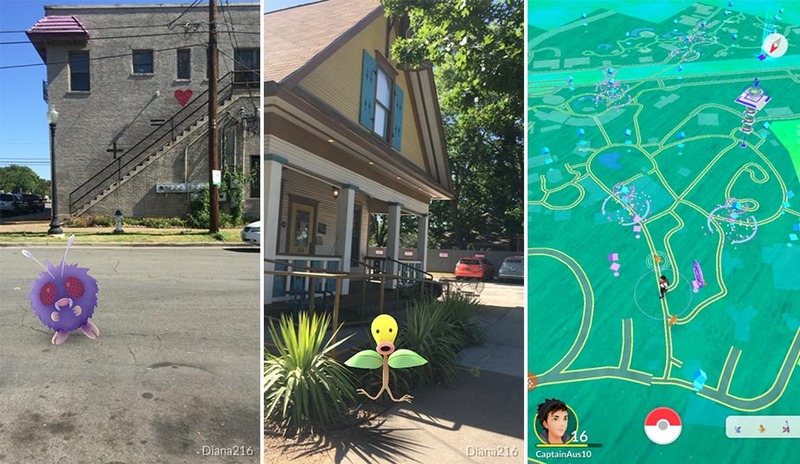 While the events aren't necessary Pokémon specific, game enthusiasts will definitely be showing up to enjoy the garden and abundance of Pokéstops and gyms. Take in the sounds of the game with a unique presentation just before Halloween. Don't forget to dress up as your favorite Pokémon! Meet some of the top Pokémon Go trainers in the area and enjoy the park while adding to your Pokédex. After the park, everyone will head to local bars (all in walking distance or a quick ride away on the M-Line Trolley) to talk about their latest conquests over brews and cocktails.